The Oculus Rift needs a powerful graphics card to run it, so we had to ditch our dual Radeon 7990’s for a ROG GTX 980TI Poseidon, which features a built in Waterblock. The Oculus Rift setup took around half an hour all together, which included: installing various drivers, updating graphics drivers and configuring the Oculus Rift. 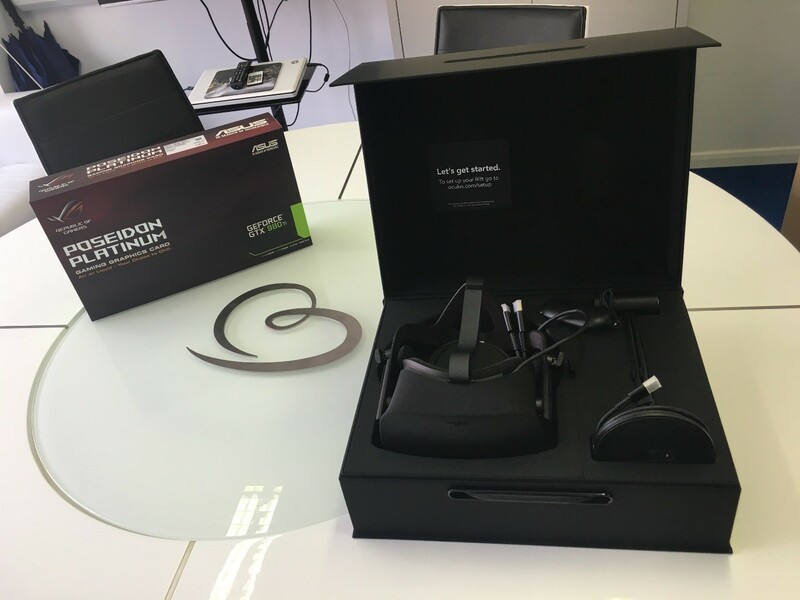 It was all very straight forward and user friendly; we could tell that the team behind the Oculus Rift had gone through lots of UAT. We’ve been closely following the Oculus Rift, when pre-orders were announced in January, we were first in line to order our consumer version. The delivery of the Oculus Rift was delayed, and we were checking our order history on a weekly basis to see if there had been any updates. When it finally shipped, we eagerly awaited its arrival like ‘kids on Christmas morning’. Our first impressions were very positive. It came well presented in a suede-lined box, which could only be described as “Apple-esque”. The reactions from the team were priceless; for the majority, it was a first time experience of Virtual Reality. Watching it on a monitor isn’t anywhere near the same experience as watching it on screen. We’ve collated a few videos of the reactions of some of the team. Apologies in advance for any swearing. For static VR environments, the Oculus Rift works really well and the applications are endless. For example, you can be sat inside a brand new sports car, you could watch an Apple keynote session as if you were a member of the audience, or be up close on stage with your favourite band. In contrast, with anything that involved lots of movement, a few of the team encountered motion sickness and felt disorientated. In effect, there’s a set of stairs that which everyone begins to lean forward as if they were walking down a flight of stairs; this threw many people off balance. VR Motion sickness is triggered from the human mind receiving conflicting messages between what your eyes are seeing and what your body is doing. It thinks you’ve eaten something hallucinogenic, and reacts by making you want to be sick.